Family of missing soldier Hadar Goldin slams PM, Security Cabinet over cease-fire reports after 460 rockets fired into Israel. 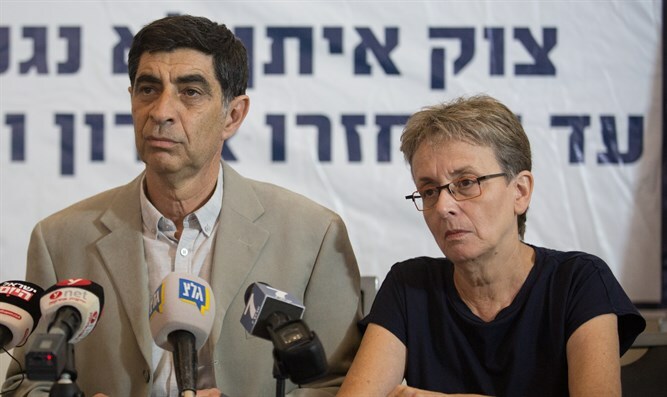 Dr. Leah Goldin and Prof. Simcha Goldin, the parents of IDF soldier Hadar Goldion, whose body has been held four over four years by the Hamas terrorist organization, harshly criticized Prime Minister Binyamin Netanyahu and the members of the Political Security Cabinet Tuesday. The Goldin family criticized the government over reports of a cease-fire agreement with Hamas following the launching of about 460 rockets and mortars at southern Israel over the last two days. "Our hearts are with the residents of the periphery," the parents said. "Prime Minister Netanyahu and the ministers in the political-security cabinet are not meeting their obligations and their promises to the residents of the south just as they do not fulfill their obligation to return the soldiers and civilians from Hamas." "Netanyahu and the cabinet are striving for a cease-fire and are not working to solve the issue of the captives, and Israel must demand that Qatar act immediately." Hamas has confirmed the report that an Egyptian-brokered cease-fire had been reached, but made it clear that the organization would be obligated to it only as long as the "Zionist enemy" fulfilled its commitment to the cease-fire. Israel refused to approve the report. An Israeli political source responded to reports of agreements on a cease-fire: "Hamas approached Israel with four different intermediaries and asked for a cease-fire, and Israel responded that it would determine the steps in the field and that Israel reserves its freedom of action."